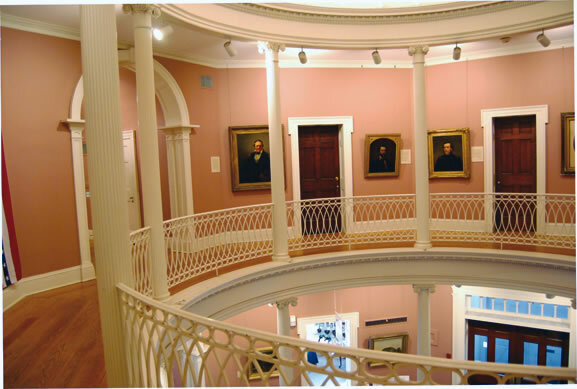 The New Haven Museum was founded in 1862 as the New Haven Colony Historical Society, which remains its corporate name. From the beginning, the institution sought to collect, preserve, and make available for research the materials which document the history of the greater New Haven area. The Society was housed in various locations around the City in the 19th century, including the City Hall and the State House on Green. The English Memorial building on Grove Street was the first location owned by the Society. In 1929, the current building on Whitney Avenue was built, designed by J. Frederick Kelly, noted colonial revival architect. The collections eventually evolved into the departments of the organization: the Whitney Library, the Photograph Archive, and the Curatorial Department. These departments care for books, manuscripts, maps, photographs, furniture, paintings, tablewares, textiles, and industrial and marine artifacts. Many well-known New Haven people who had an interest in history made up its membership and board of directors, including Thomas F. Trowbridge, Charles Hervey Townshend, John Warner Barber, George Dudley Seymour, and William Scranton Pardee. Yale administrators and professors have been among the leaders here including Williston Walker, Charles M. Andrews, and Leonard Labaree. The organization has always stressed scholarship. In the early days members gave lectures on various topics, many of which were published in the New Haven Colony Historical Society Papers, in ten volumes, from 1865 to 1951. The mid-twentieth century saw the development of a Journal, which included many significant works of the local history. Exhibition catalogues have been published including such topics as: silver, pewter, graphic images of New Haven and maritime history. The New Haven Museum seeks to educate young people and adults, and an Education Department was established to provide programs and educational outreach. Never just a museum of New Haven, the history of the area once included in the New Haven Colony is now within the range of interest of the organization, as it looks to the 21st century and a renewed emphasis on regionalism in local history. Recently, Doris (Deb) Townshend wrote a brief history of the New Haven Museum in honor of the Museum’s 150th Anniversary. Click here to learn more about the Museum.